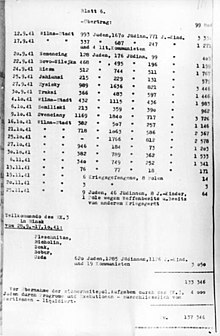 In November 1941 Himmler was dissatisfied with the pace of the exterminations in Latvia, as he intended to move Jews from Germany into the area. 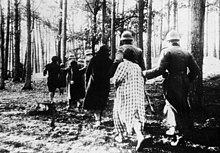 He assigned SS-Obergruppenführer Jeckeln, one of the perpetrators of the Babi Yar massacre, to liquidate the Riga ghetto. Jeckeln selected a site about 10 kilometres (6.2��mi) southeast of Riga near the Rumbula railway station, and had 300 Russian prisoners of war prepare the site by digging pits in which to bury the victims. Jeckeln organised around 1,700 men, including 300 members of the Arajs Kommando, 50 German SD men, and 50 Latvian guards, most of whom had already participated in mass killings of civilians. These troops were supplemented by Latvians, including members of the Riga city police, battalion police, and ghetto guards. Around 1,500 able-bodied Jews would be spared execution so their slave labour could be exploited; a thousand men were relocated to a fenced-off area within the ghetto and 500 women were temporarily housed in a prison and later moved to a separate nearby ghetto, where they were put to work mending uniforms. Hillgruber, Andreas (1989). "War in the East and the Extermination of the Jews". In Marrus, Michael. Part 3, The "Final Solution": The Implementation of Mass Murder, Volume 1. The Nazi Holocaust. Westpoint, CT: Meckler. pp. 85–114. ISBN 978-0-88736-266-8. Shelach, Menachem (1989). "Sajmište: An Extermination Camp in Serbia". In Marrus, Michael Robert. The Victims of the Holocaust: Historical Articles on the Destruction of European Jews. 2. Westport, CT: Meckler. Streim, Alfred (1989). "The Tasks of the SS Einsatzgruppen". In Marrus, Michael. The Nazi Holocaust, Part 3, The "Final Solution": The Implementation of Mass Murder. Vol. 2. Westpoint, CT: Meckler. pp. 436–454. ISBN 978-0-88736-266-8. Earl, Hilary (2009). 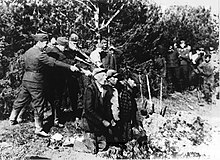 The Nuremberg SS-Einsatzgruppen Trial, 1945���1958: Atrocity, Law, and History. Cambridge; New York: Cambridge University Press. ISBN 978-0-521-45608-1. Förster, Jürgen (1998). "Complicity or Entanglement? The Wehrmacht, the War and the Holocaust". In Berenbaum, Michael; Peck, Abraham. The Holocaust and History: The Known, the Unknown, the Disputed and the Reexamined. Bloomington: Indian University Press. pp. 266–283. ISBN 978-0-253-33374-2.